Pet kittens are not sold with any breeding rights. We will take your preferences into consideration, but cannot guarantee that a specific gender or color will be available from any given litter. Our kittens are placed according to your required allergen level. If you are offered choice from one litter and none match your specifications you may choose to wait until a future litter is available. Feel free to ask about the 2017/2018 breeding plans. If your cat allergies are very severe, or if you have severe allergies to rabbits, horses, or egg white, I ask that you contact me to see if we can arrange a visit to test with a Siberian prior to completing your Kitten Application. If you have a child in the family under age 15 years of age with cat allergies please contact me before sending in a deposit. All of our kittens are allergen tested and reports are available to confirm the allergen level of the kitten chosen to join your family. Do you own? or rent? What do you know about Siberians? Tell me a little about your family to help me choose the right kitten for you. If yes, How do you plan to protect your kitten against dangers while outdoors? Please be aware that we do not support declawing. We believe this is cruel and abusive and will not place our kittens in danger. Your health guarantee will be voided if your kitten is declawed. The Application Fee is non-refundable and may be applied only toward purchase of a kitten. Kitten is purchased as a pet and will be spayed/neutered before going to your home. Pet Agreement: $200 deposit. We accept e-mail transfer of funds, certified cheque, money order or cash. Kitten Application fees are non-refundable. Sibericat Siberians reserves the right to return the application fee in full thereby terminating this agreement at any time, if deemed to be in the best interest of the cattery or kitten. 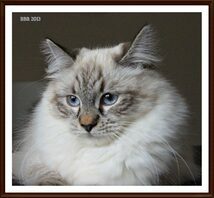 Thank you for choosing Sibericat Siberians for your new family member.